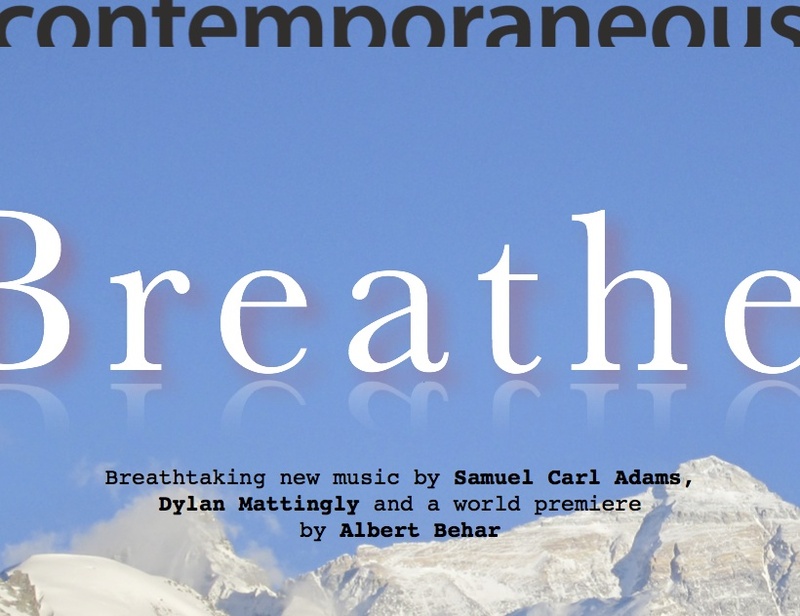 Breathe is an evening of breathtaking new music that follows the contours of our soul, tracing both metaphorically and literally the music of our must common and crucial action. The show features works by three composers under the age of thirty living and working in New York. However, these composers also share roots in the cool fog of the San Francisco Bay Area — a strain evident in all three works. Brooklyn-based composer Albert Behar (b. 1991) draws alike from the meditation of Zen Buddhism and his experience in pulmonology to create a new work that explores the physical and mental sides of breathing. Amplified through a device that his grandfather invented, Behar’s amplified heartbeats will provide a live pulse for the work as he sings with the ensemble and vocalists Lucy Dhegrae and Sean Christensen in his world premiere work Beauty in Breathing, a Contemporaneous commission. Samuel Carl Adams (b. 1985) is quickly gaining renown as “a composer with personal voice and keen imagination” (New York Times) who is deeply at home in a vast array of genres. His work twenty-four strings is rooted in the pure sadness of Renaissance music, a gorgeous string sextet that weaves its way through sounds like bells and waterfalls. Closing the program, Contemporaneous co-artistic director Dylan Mattingly’s (b. 1991) Atlas of Somewhere on the Way to Howland Island is an epic tone poem for chamber orchestra, complete with toy piano, harpsichord, and de-tuned harp. An emotional depiction of the final flight of Amelia Earhart, this work traces Earhart’s journey from its spirited beginning to the tragic end, but the jubilant finale sends Amelia’s spirit out into the stars.